Finding the right balance of nutrition for your fish is always tricky especially in community tanks where different species have different dietary requirements. Some fish need a strictly vegetarian diet in order to be healthy, but most commercial food preparations contain fish or meat. How should you go about providing for these fish effectively? Besides strictly vegetarian fish like plecos and mbuna, most fish can benefit from extra roughage in their diet, which helps to keep the gut healthy. Most fish have an instinct for what they should be eating, so keep your tank well stocked with plants which they can snack on if they feel the need. Of the commercial foods which are available for vegetarian fish, most take the form of pellets or wafers which are mostly composed of spirulina algae. Often this has been fortified with vitamin and mineral supplements, so it can be a good food to provide if your fish are looking under the weather or if you want to get them in good condition prior to breeding. Hikari and Tetra make good quality vegetable-based foods which are sufficient for the needs of most vegetarian fish. However, you should be aware that some commercial vegetarian foods contain a lot of wheat. Gluten allergies are not uncommon among fish. If your fish has a gluten allergy it will become swollen around the belly after eating wheat-based foods and it may experience difficulty adjusting its balance in the water, resulting in stress. In the long term this can lead to serious health complications. Fish with such problems should be moved onto a strictly algae-based diet or should be fed wheat-based foods no often than every third day. Many people purchase vegetarian fish because they hope that they will feed themselves - by eating the algae which otherwise builds up in the tank. However, if you have a community of such fish, there won't always be enough algae to sustain all of them. Some aquarists opt to grow algae in a separate tank, under strong lights, and harvest it to feed to their vegetarian fish. Peas -These should be gently boiled and should then have their outer skins removed. 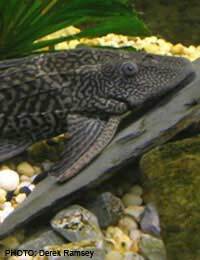 For fish with small mouths they should be crumbled before being added to the tank. Peas are a particularly good source of protein. Sweetcorn -This should be prepared in much the same way as peas. It provides a good source of bulk carbohydrate and is useful for tempting fish who are off their food. Courgette -Courgettes should be par-boiled and sliced into thin rings before being added to the tank. Your fish will then enjoy pulling them apart. Lettuce - this should be blanched, which you can do by putting it in a mug of boiling water. Your fish can then nibble it from the surface much as they would a commercial flake food. Along with these foods, you should provide strictly vegetarian fish with a piece of driftwood to gnaw on. This will help them to balance the acidity of their diets and will provide a satisfying activity. As with any feeding regime, it's important to provide a balanced diet, so variety is good. Most fish will also respond to food more eagerly if it is varied. The foods listed above are not strictly for vegetarians, but will be enjoyed by other kinds of fish too. Vegetable foods can provide folic acid and carotenes which are not always available in other foods; as well as improving general health; these will help to bring out their colours, displaying them at their very best.